Hey Coffeeholics! Regina Iustitiae Sorority, the oldest running sorority in Ateneo Law School, will be commemorating its 6th Anniversary. They will be having a 1 day fair/event at the Rockwell Tent on September 18, 2011, Sunday, from 10 am to 10pm. 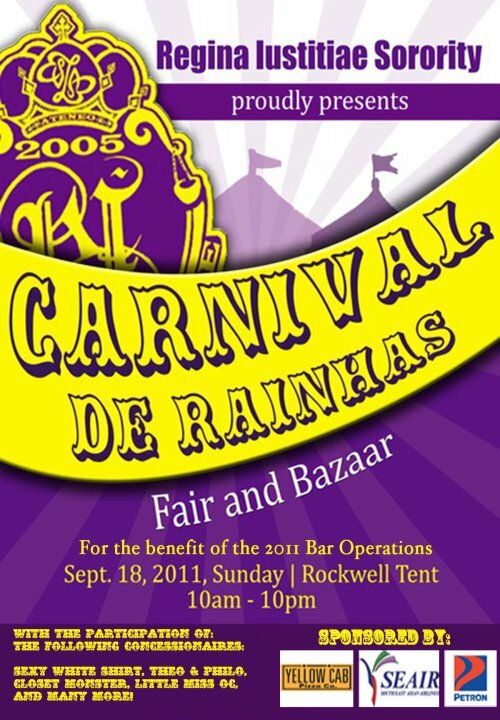 There are over 50 booths at Carnival de Rainhas featuring not only the usual fashion, accessories, and trinket items but also a traditional carnival or fair booth experience. Its a bazaar that even the whole family can enjoy! Entrance tickets are priced at Php 100 only. For more information or ticket inquiries, you may contact MAIQUI LAUREL at 0918-9630473. You may also visit their Events Page on FB where info and pics where taken from. So coffeeholics, have you been in a fair before? What was your favorite type of booth? Pls. do share your experiences and comment!